Jane Eagland’s earlier book for young adults, Wildthorn, saw its young heroine confined to a Victorian asylum as the penalty for difference from contemporary norms. 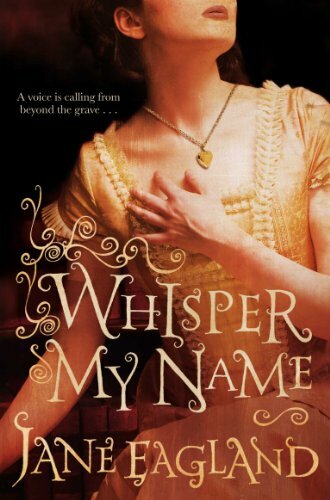 Whisper My Name returns to the Victorian era and another young woman set on self-determination in the face of society’s expectations, embodied in her crusty, uncommunicative grandfather, Sir Osbert Swann. Following her mother’s death, Meriel has been sent from the warmth and comparative freedoms of an artistic household to Sir Osbert’s chilly Kensington town house. Meriel misses her father, who has remained in India, while she has only a few treasured mementoes of her mother, including a locket. In London, she is subjected to a stifling routine with her mousy governess, as well as periodic unexplained measurements of her physique and tests of her mental ‘capacities’ by her grandfather, who seems to be obsessed with questions of heredity. Her only consolation in the household is a friendship with Sally, the young housemaid, and a fleeting sense of a ghostly well-wisher who manifests herself through a gentle touch, but remains unseen – could it be Meriel’s mother? Illicit walks in the London streets, with Sally’s connivance, lead to an encounter with the raffish Mrs Jolly – an Indian acquaintance of Meriel’s father – and through her, into the netherworld of mediumship. Attending a séance with Mrs Quinn and her strangely subdued young assistant, Miss Casson, gives Meriel hope that she can communicate with her mother, but what transpires is completely unexpected. Soon Meriel is on a journey into the backstreets of London to uncover the mystery attached to her birth, which seems to be linked to the two locks of her hair in her mother’s necklace. This is a glorious romp of a book which gains momentum and gravitas as the story progresses. Yes, at times, the young heroine seems remarkably modern for a ‘Victorian Miss’ – perhaps a function of the resolutely non-archaic register, which only falters when Eagland uses housemaid cockney or nineteenth-century slang. And, yes, a book which dips into a ragbag of contemporary obsessions from mediumship to eugenics, employing an equally Victorian array of plot devices: coincidences, revelations by letter and diary, a long-lost twin – while Meriel’s hopes of a theatrical career seem particularly anachronistic. However, the story is told with huge energy and warmth; and, while some of the minor characters, like the foppish Mr Utterby, are broad-brush comic creations, the three main female protagonists are drawn with great empathy. The book’s real strength lies in its female characters: the depiction of Sophie’s growing maturity, as she learns to empathise with others’ difficulties, is particularly sensitive and Whisper My Name will find enthusiastic female readers. It would make a terrific springboard into Wilkie Collins and Dickens.